Decorating our porch for every season is at the top of my list! 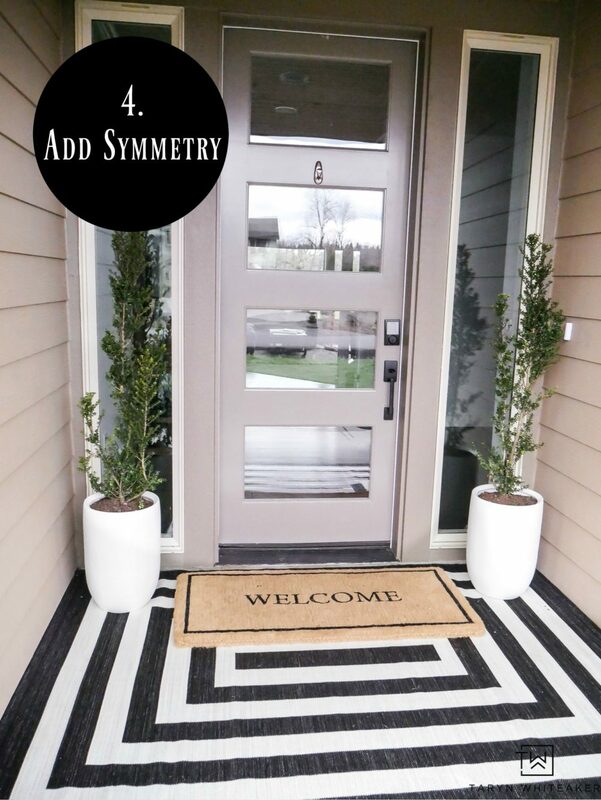 I’ve said it a million times by now but I truly believe first impressions matter, so get those porches decorated! Ok but for real, it is the first place that your guests see when they arrive and it really sets the whole tone for your home. 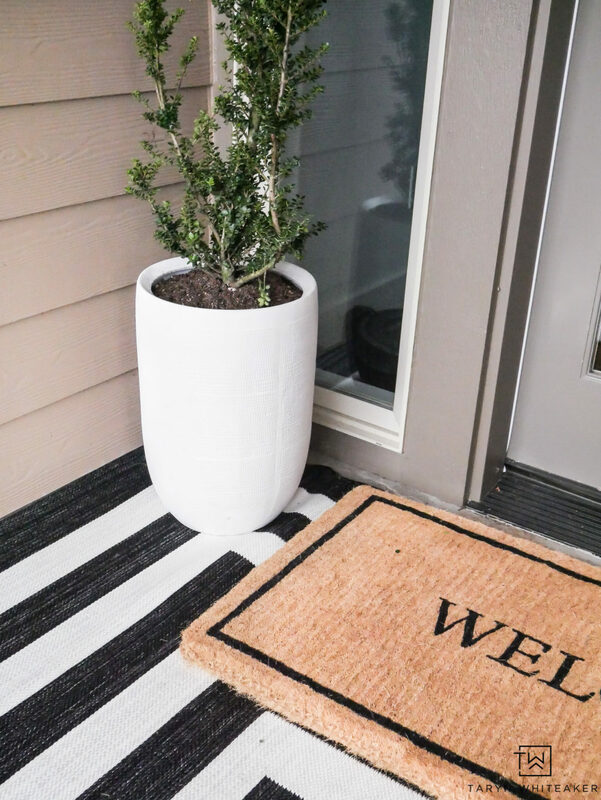 This past weekend I spruced up our sad post winter porch with new modern spring porch decor. 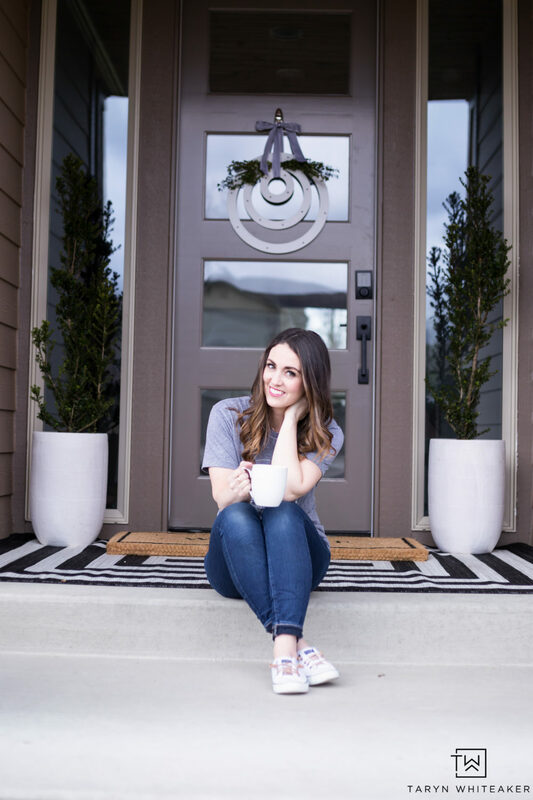 Over the years I’ve decorated quite a few porches and I thought I’d share some of my porch decorating tips with you today. 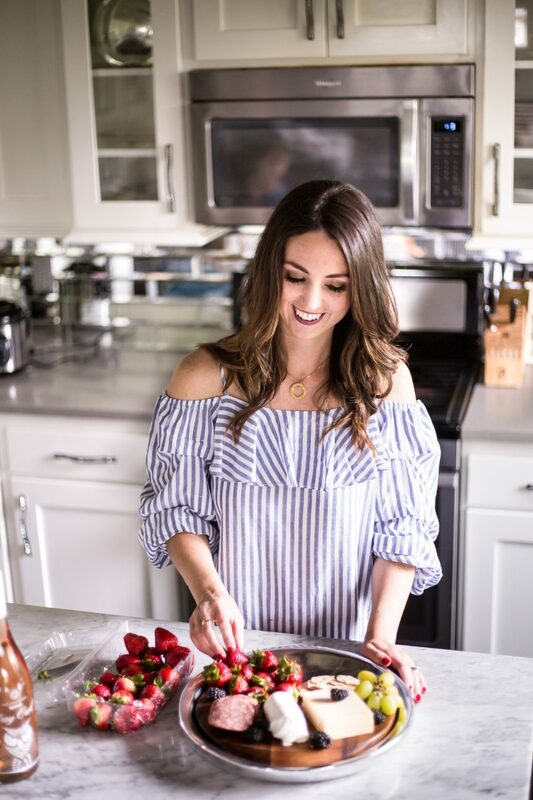 I’m also joining several other bloggers who are sharing their own tips for decorating their homes for spring, so keep scrolling to the bottom to see everything! I had a few key items on my list for our porch this year, I wanted it to have a “less is more” look with just a few simple shrubs. I also wanted to mix different patterns and textures by layering rugs. I set out on an adventure to find exactly what I was looking for, it took FOUR stores but I finally found what I wanted. 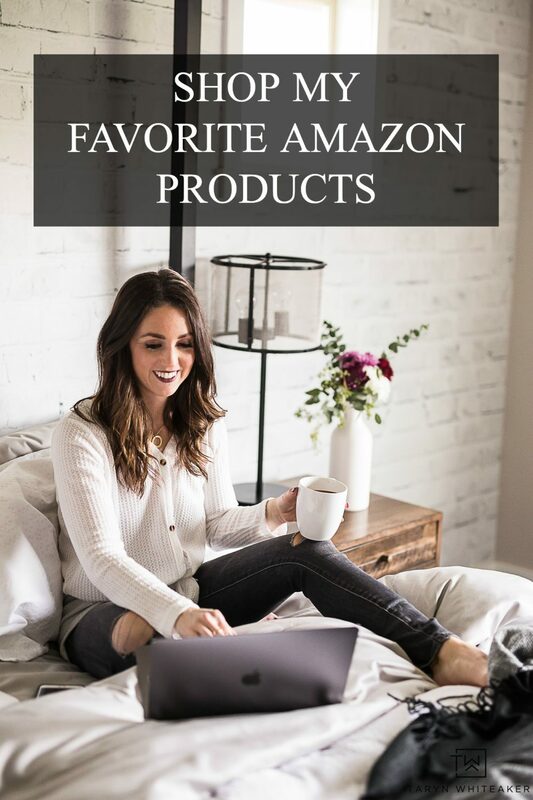 One might think this post is an ad for Target, but nope I just coincidentally found everything I was looking for there! Gosh, Target always has the best stuff! 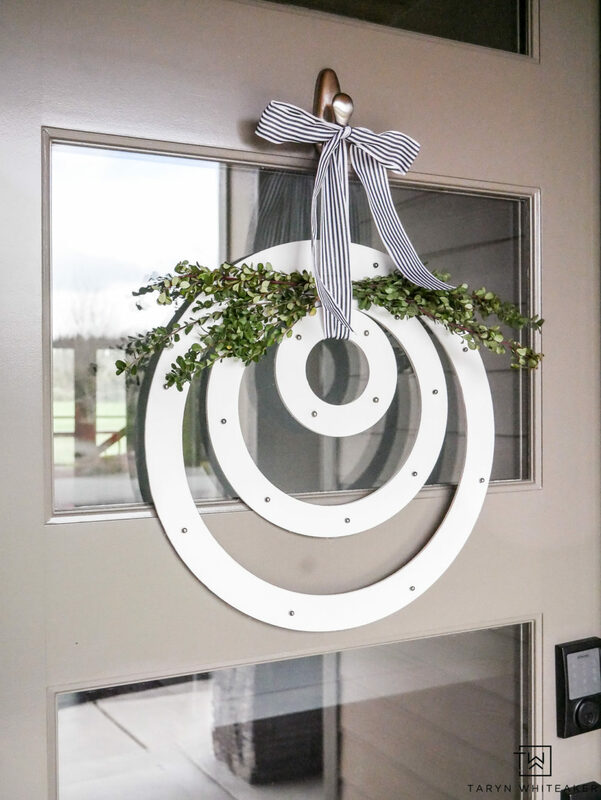 This wreath though was a DIY project! I’ll be sharing the tutorial for that on the blog soon. Now, I want to share some of the ‘rules’ I follow when I decorate my porch for various seasons. These are just a few of the things I keep in mind when pulling my decor together. Pick an item to ‘weight’ your look down. 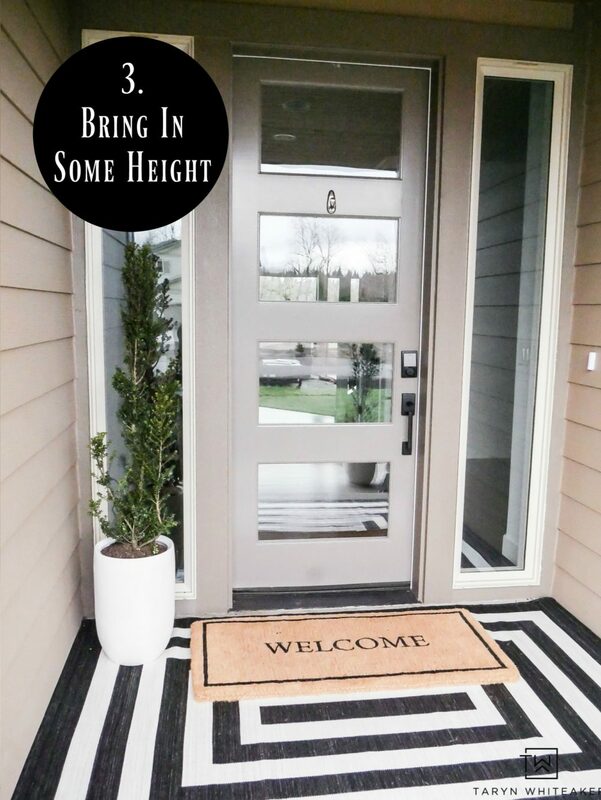 For me, it was this black and white outdoor rug that fit my space perfectly. The pattern draws your eye down and gives the entire look some character but it can be too much if left by itself. 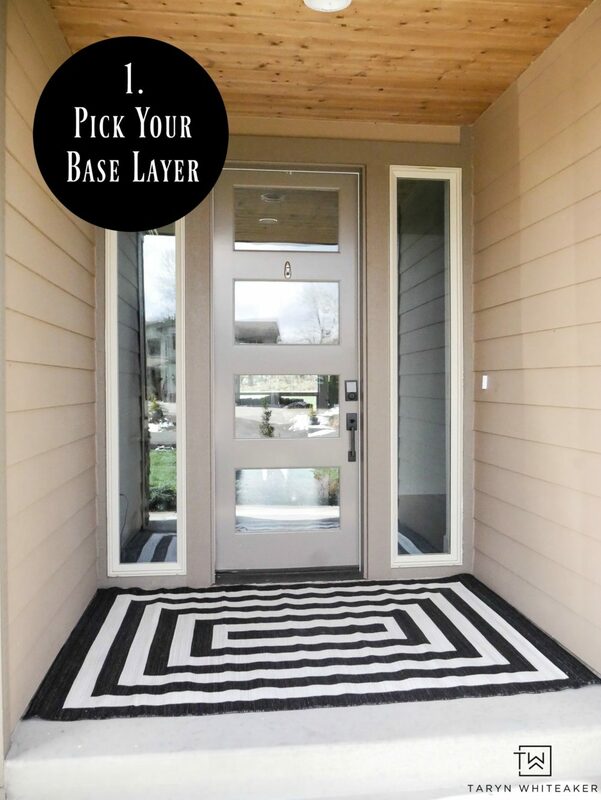 I’m a huge fan of layering rugs and that includes the porch. 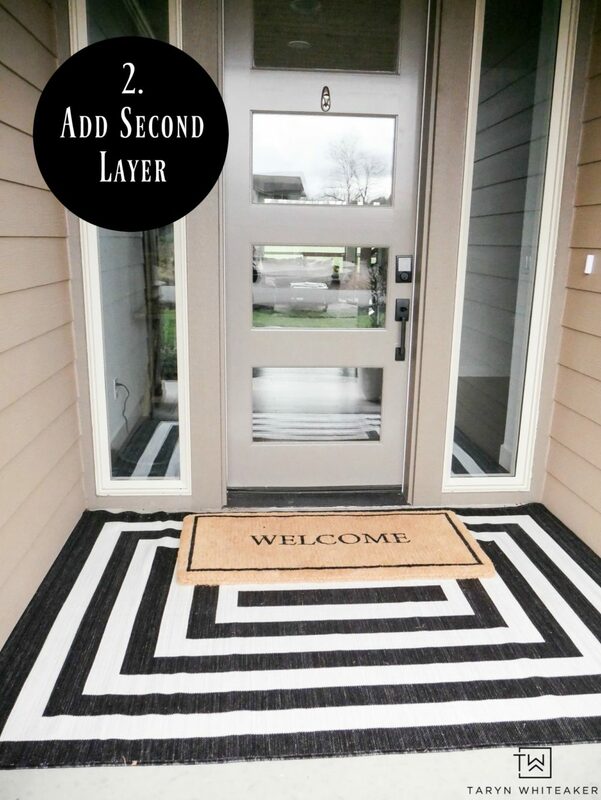 The black and white is the base layer and then the welcome mat gives it a little classic touch and brings texture to the space. This is where you want to add some heigh to your design and plants are the best/most obvious way to do this! When picking out your plants you need to keep your portions in mind. Since I have tall skinny windows and a taller front door, I need more height on each side of my door. Where some of you might be able to get away with two medium size planters with cascading flowers. I am a huge fan of symmetry. I don’t always think things need to be ‘matchy matchy’ but I need balance in all my designs. I do typically like symmetry on my porch, what I do on the left I want to mimic on the right. In this case I chose two of the same trees, but last year I did the same clump of three planters. Last, add the details! I added a little wreath on our front door, but you might add a few lanterns if appropriate or maybe a cute shoe tray. Now excuse me while I sit on my front porch and enjoy this beautiful spring weather we’ve been having because you never know how long it will last! 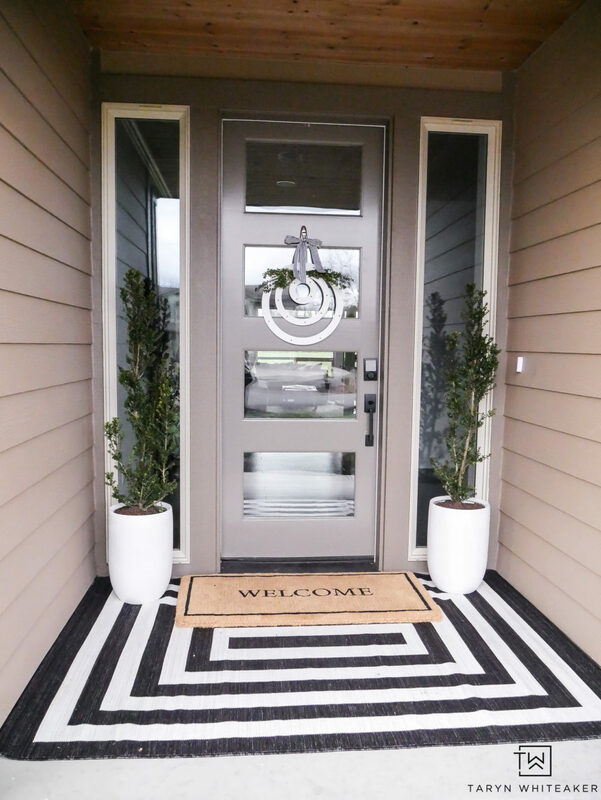 LOVE the layered rugs, Taryn! So crisp and fresh and welcoming!! Oh I love that you layered your rugs, how cool! 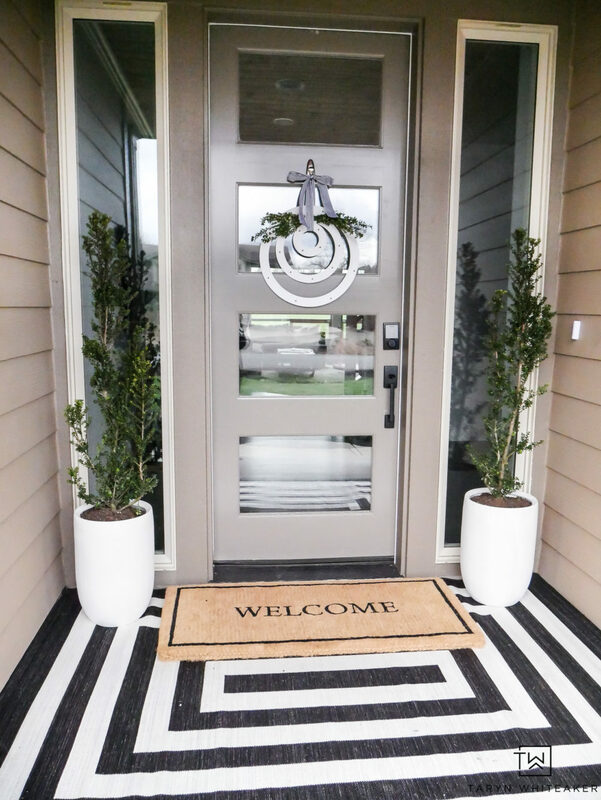 Loving the classic black and white too, modern and welcoming! this is a great look. what are those tall plants, then, and did you fill the whole pot with soil or half soil, half something else to make it lighter? I love what you did here! Looks perfect! 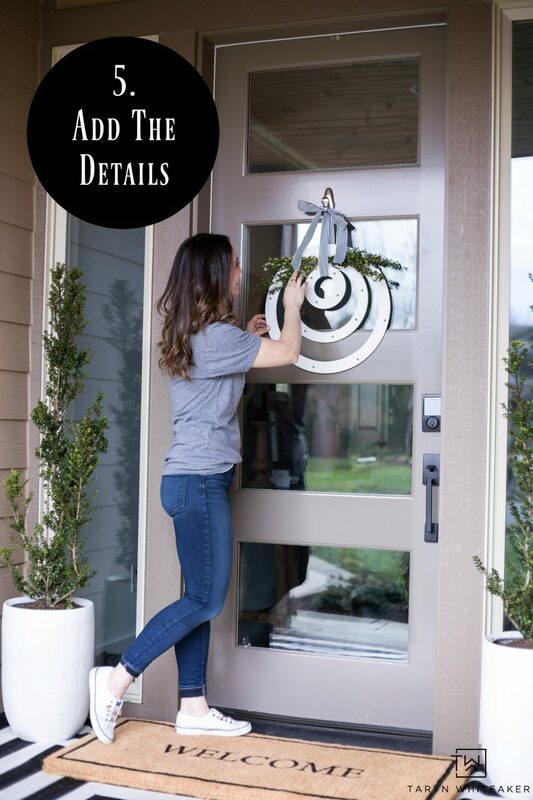 What a unique and pretty wreath on your door! Love the look, Taryn. Thanks so much for being on the tour! I love your front porch. The layered rug/door mat, brilliant. The tall pots with trees, you nailed it. Simple and fabulous. Love it! The planters are not in stock at Target anymore. Where would I be able to find some similar ones? Thank you! Lovely!! What kind of plants are those? Where did you get the wreath!? ?